In business, for success, there should be a natural flow to things. Perhaps you notice it when a business deal just comes together or when you attend a business meeting where the conversation and ideas just keep coming or as you go through your day everything just happens as it should and on schedule. When you have business days that just seem to flow from meeting to meeting, conversation to conversation, idea to idea, it is a productive and potentially profitable day. Why does this happen? Because of you and the people you work with or come in contact with every business day. Has anyone ever asked you what business you’re in? You may respond with, for example: software, digital marketing, construction, manufacturing, logistics, automation or PR. It could be almost anything. That may be the industry you work in but the business you are in is: the people business. If you are in the people business and you just happen to sell whatever product or service you sell but you don’t take the time or effort (including using, for example, Nimble as a CRM tool) to get to know the people you work with or want to work with then the truth is: you’re not going to be very successful, long term. Success will be erratic, at best. That’s not what you want, do you? Everyone you work with and do business with has different needs. Understands business in a different way. • What are their business needs? • What business problems do they need to solve that would make them feel more productive and even, more profitable? • What in their business life is especially challenging? • How do they respond to the business issues faced? • How can you more effectively communicate with them? • Is it better to communicate with them verbally, through written words or visually? Or perhaps a mix? • What’s the best pace to conduct a presentation or conversation? Faster or slower? Just the facts or more details? • How easy is it for you to connect with customers and prospects? • Do customers and prospects trust you? Get to know your customers and prospects, what their business needs and concerns are. As you do, adjust and custom fit your conversations and presentations accordingly for more business success. What about your key customers that you’ve been doing business with for a long time? Do you ever just call them up to say “hello”; to check in without any sales pitch or to thank them for their business? If you haven’t done so lately, start today to schedule it onto your calendar. If appropriate, consider taking a customer to lunch or stopping in for a visit at their office. Getting to know your customers is an ongoing business strategy to maintain the momentum of success. In addition to prospects and customers, let’s also consider your co-workers. 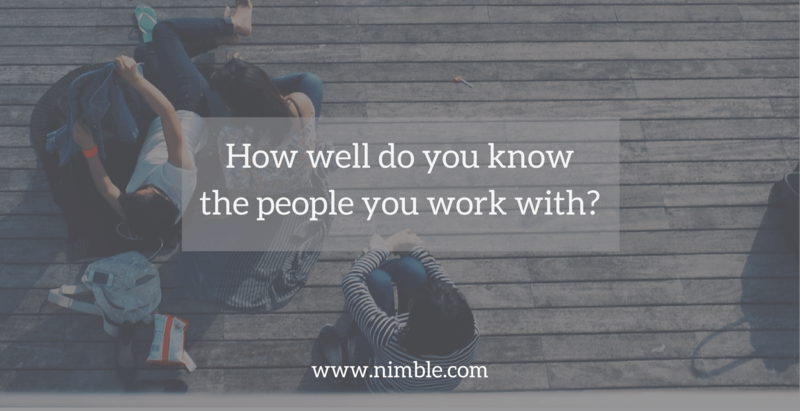 How well do you know the people you work with at your company? • How do your co-workers think? • How often do you stop and ask how someone’s business day is going? If you understand where an individual co-worker is coming from and what their experiences have been then you can understand how best to communicate with them and to express what needs to get done. You need to know your co-workers and they need to know you. Let’s take the coldness out of business. Let’s not make it so sterile. Many years ago, before the advent of modern day technologies, people mostly conducted business based on personal relationships they developed with others. That’s how towns, cities and communities were based. Today, because of the internet and a global society we have the opportunity to connect and communicate with people everywhere. Yet we don’t take as much time as we could to connect in a more direct way. Remember: You are in the people business. Business success begins with the people you work with and how well you know them. So the next time you start to text or email someone back ‘n’ forth countless times, try picking up the phone and see where the conversation takes you. Be open to possibilities that can create better business. Know who you are doing business with or working side-by-side with. Understand who you are so you can understand how to help people better. Isn’t that what business is all about?